Design should be a great, unexpected and considered experience. Studio Skiffle ( § ) is the award-winning design and art practice of multi-disciplinary maker Marshall Lambert. Through a process and research-rich approach, her work combines both traditional and conceptual graphic design practices yielding well-considered, experiential solutions through thorough, thoughtful execution. Studio Skiffle specializes in editorial and publication design, illustration, and design mentorship. 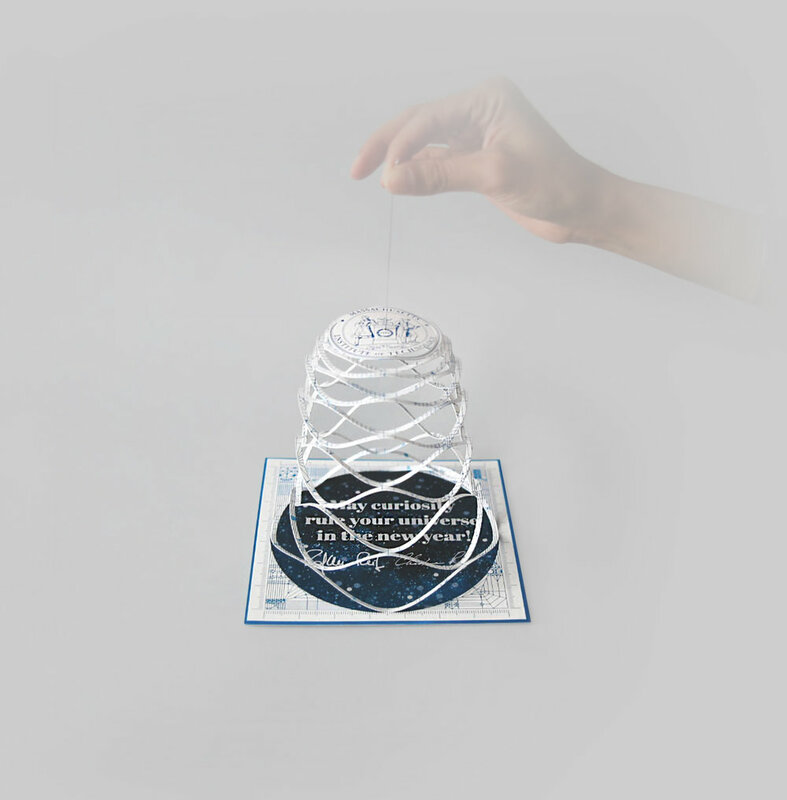 Designed for MIT President, L. Rafael Reif, and Mrs. Christine Reif, this card embraces craft and encourages curiosity. 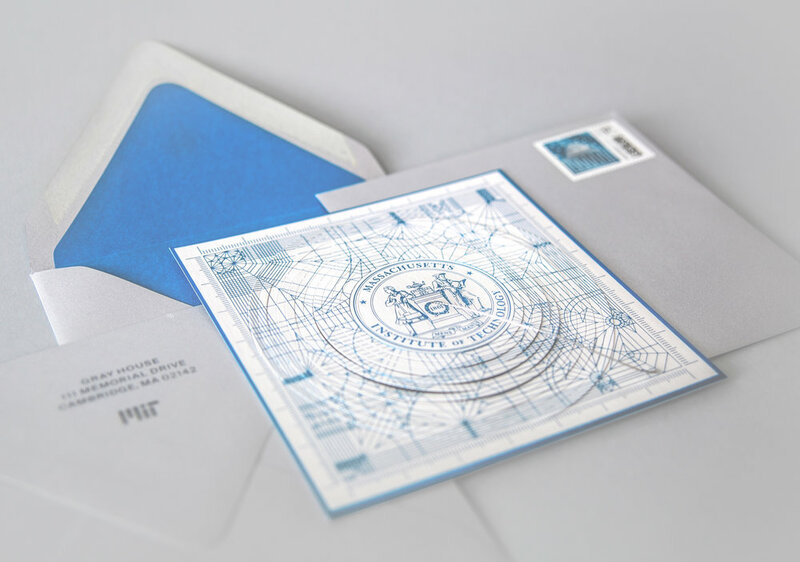 Foil stamped in a bright, lively blue, the front of the holiday card features the MIT seal and an origami crease pattern created by MIT alumnus, Brian Chan. From the information printed on the back of the card, we learn that Chan’s pattern folds into the figures featured in the MIT seal that represent MIT's motto of "mind and hand." Recipients were directed to view a video of Brian constructing the origami. I was initially inspired by a collection of cobweb valentine cards that live in The Metropoliton Museum of Art’s Department of Drawings and Prints. The Met originally shared the collection in a blog post in 2017 which featured several particularly rare and delicate cobweb designs from as early as the 17th century. Project Duration: April 2018 through December 2018. Specs: 6.25” Square Card: This card is duplexed together with 105# Smooth Stardream in Crystal for the front panel and 100# Cover weight Stardream in Silver for the back panel. The interior (underneath the cobweb) and the back of the card were printed using an HP Indigo Digital Press at Puritan Press. Specs; 6.5” Square Envelopes: Silver Stardream envelopes with Adriatic Blue liners from Cards & Pockets. Special thanks to our Print Production Liaison, Jake Faiola at Puritan Press for working with us bring this card to life! Please use the form below to be in contact about a project, collaboration, or to just say something, like, "hey, holler, hi." Thanks for your message! If it requires a reply from me, I’ll be in touch soon.